Spinning Pulsar - Solar System Planets And Moons Section. Spacecraft have found spinning pulsar. Cassini scientists Make New Ring Discoveries. Cassini scientists have announced a host of new findings about Saturn's rings, including some new knotted structures in the planet's F ring. One of the major discoveries is that parts of Saturn's D ring (its innermost ring) have relocated and dimmed. In fact scientists have been able to track fairly significant changes between when Voyager first visited Saturn 25 years ago. The delicate G ring seems to contain faint arcs, which might be hiding additional planets. And most surprisingly, knots in the planet's F ring seem to be arranged like a coiled spring winding around the planet. Star Gobbles Up Its Friend. The ESA's Integral space observatory and NASA's Rossi X-ray Timing Explorer spacecraft have found a rapidly spinning pulsar in the process of consuming a neighbour. 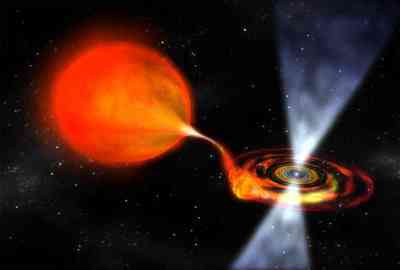 This discovery supports the theory that pulsars spin so quickly because they pick up material from a companion, which increases their mass. Pulsars were once stars more than 8 times as large as our Sun, but their intense gravity compacted them down to a size of about 20 km (12 miles) across.